A high school teacher loves her students. About to retire, she receives her toughest assignment ever. A renowned historical figure provides support via a young colleague, and a school caretaker takes an interest. Catastrophe averted? 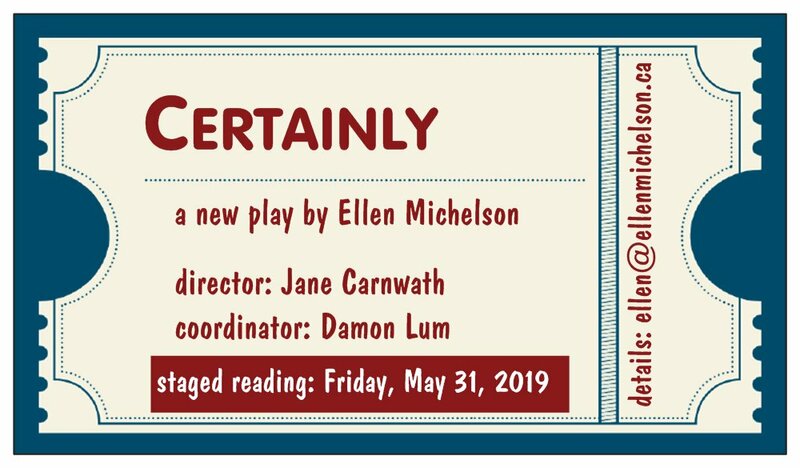 A talkback will follow the staged reading of this short play. Come, laugh, groan, sigh, and share your views. Revelation: format affects self-feedback. Editing on my screen brought – I hope – improvement. Reading my book draft on my tablet yielded different insights. Notes made brought – I hope – further improvement. Next: careful study of the manuscript in hard copy. What will be revealed? All welcome – no charge. 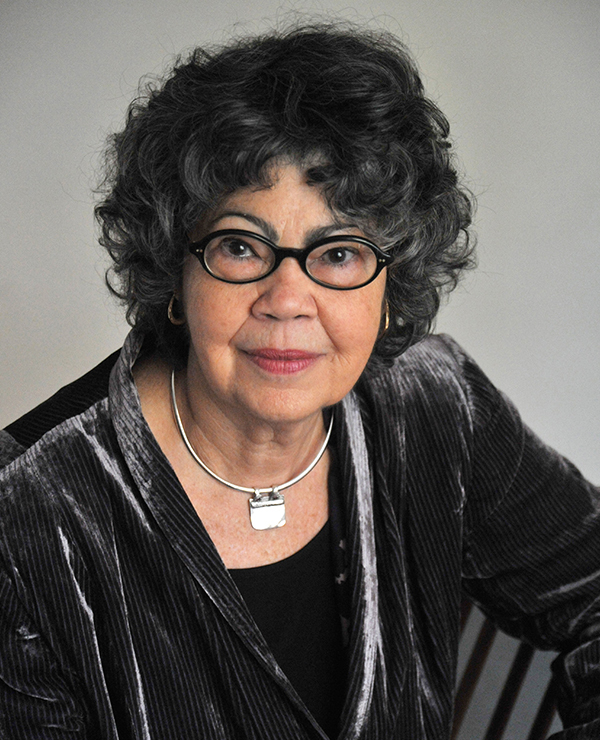 The featured reader is Olive Senior, poet and author of fiction and non-fiction. 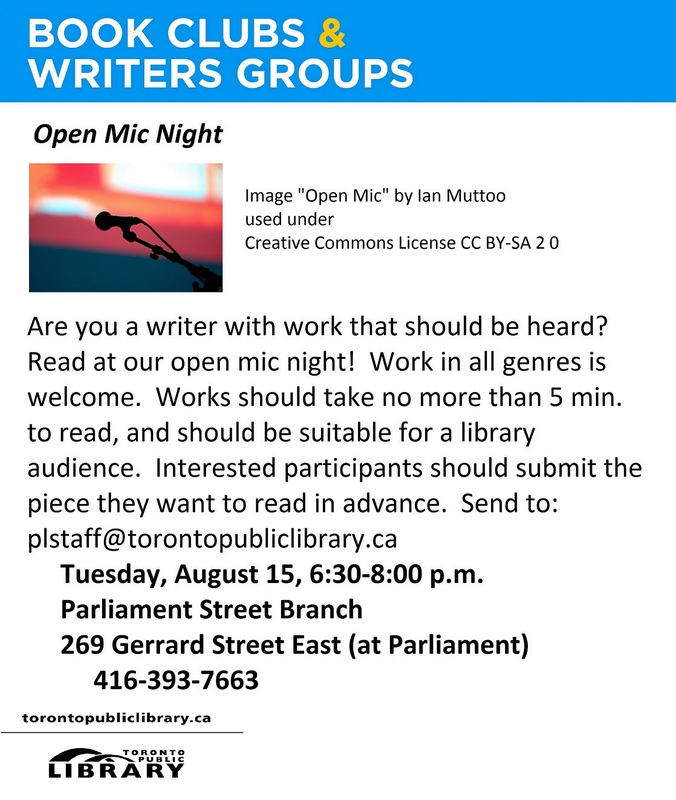 Others will be reading, too; some are members of the writing group that meets Monday evenings at the Toronto Public Library branch on the south side of Gerrard Street just west of Parliament. I’ll be reading a bit about one of my students from my memoir-in-progress. CIRA, the Canadian Internet Registration Authority, held its AGM yesterday. Because you’re reading this in a .ca domain, CIRA sent me an email explaining how I could listen online. I knew nothing about CIRA. I learned my ignorance is not surprising: the firm I pay for this domain’s registration pays CIRA. In yesterday’s presentations, CIRA people explained their research shows the .ca domain suffix is regarded highly around the world. That claim led to questions about possible nefarious .ca users. CIRA checks that .ca domain holders are in fact Canada-based. As for scammers and violence fomenters, CIRA opposes censorship, so takes down no websites, regardless of content, but supports authorities in their application of fraud and hate laws. CIRA urges all .ca holders to become members of the organization. It’s free. I haven’t joined yet, because I’m not sure how my membership would help either CIRA or me. 1. Phew: ready. This section could be working. 2. Hmm: that remark a character made halfway through. And maybe the ending could be ramped up. Better have a look. 3. Yes: fix the remark, and the ending. 4. Also: a couple more things. 5. Perfect: wouldn’t want to ruin the new concepts by writing them into the manuscript, though. 6. Um: might as well try. 7. And: fix the other stuff the fixing turned up. And re-try, maybe revert to the original where the fixing turns out to be goofy. 8. Oh: tweak words in other sections of the manuscript memory, and the Find function, have revealed. 9. Again: re-read the section. Better now? 10. Finally: it’s never done. And I’m never sure. Fredericton is blessed with a beautiful river. The foresight to create gracious parks along its banks was the city’s. 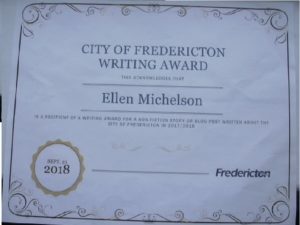 On a stroll one morning, a city staff member shared her thoughts about Fredericton’s cozy feeling — and residents’ pride in winter’s shoulder-height snow. Freelancing today is no stroll along a river. Today’s freelancers can sometimes feel frozen out of decent opportunities. More than four decades ago, PWAC’s founding writers started us on our path. Today, our collective experience is helping long-time and new members on our way forward together. 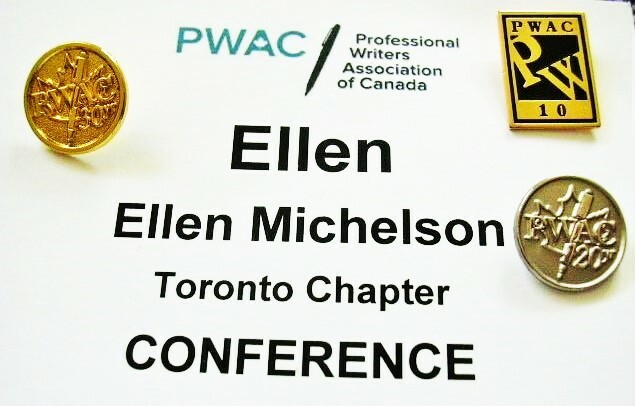 Here are my 10, 20, and (so proud of it) 30-year Professional Writers Association of Canada membership pins: the card shows I served as a Toronto Chapter delegate at PWAC’s (wow) 41st AGM in Fredericton in May, and also attended the conference. 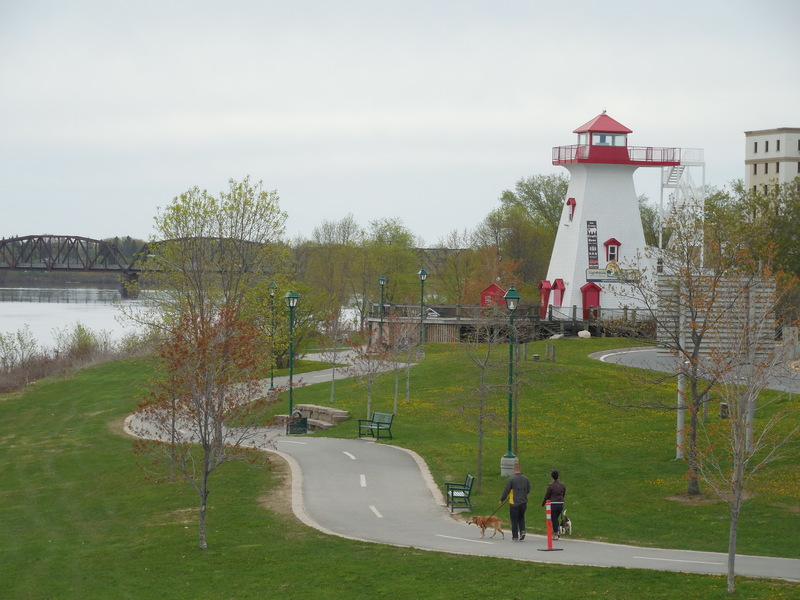 The broad St. John River sparkled in the sun, our traditional relaxations – Shakespeare and chocolate – worked well as ever, and in these tough times for writers our membership is growing. Following a story with main characters called Doug and Don would frustrate me, unless the author made clear the specific reason for interchangeable, similar-sounding names. A historical tale, a story set in well-known location with a homogeneous population, limit name choices. That my memoir features personalities from all over the world, action not far back in the past, is my good luck. My challenge has been the number of characters. Winnowing my teaching experiences to about a dozen and a half vignettes about my students, interspersed with shorter snapshots, has resulted in a manuscript with over a hundred names of students and colleagues. Nobody (but me) has her/his ‘real’ name. As well, ethnicities, ages, genders, appearances are altered, characters combined, to prevent identification. Most pieces feature only a few characters, so avoiding the Doug and Don concern has been manageable. Yet, if the main character in one vignette is Lisa, perhaps the student teacher in a couple of others shouldn’t be Elissa. After a while, I started a list of names; checking it got more complex as my manuscript grew. Vary the number of syllables among names in a piece. Some names have four or five. Avoid using the same initial for more than one character in a piece. Start some names with consonants, others with vowels. Avoid final letter and end-sound duplication. If both Kendal and Dougal are essential, end one with ll. Harder to spot are similar sounds with different spellings. If Marie is the main character, perhaps her sister shouldn’t be Emily. Vary ethnicities if plausible. Doing so comes naturally for stories about Toronto high school students. It’s possible to search online for names of various ethnicities. Some websites give names’ meanings. Some sites are more reliable and useful than others. Watch out for scary-looking url’s. Not all characters need both given names and surnames. Most of my student characters lack surnames. Some parents coin names; I’ve coined no given names for my characters. I have coined surnames, because any surname significantly less oommon than Smith will surely belong to someone identifiable, who, if s/he discovers my book, may be distressed. I’ve not found the coined names online, have rejected many surnames that turn out to belong to actual people. I hope very common names for minor characters don’t infringe. Some real people, living and dead, appear in my manuscript. Some, not all, of their names limit name choices. I often taught twentieth-century Canadian history. John Diefenbaker appears, as does a character I’ve named John, but because Lester B. Pearson appears, no other character is named Lester. I want to feel each name I choose somehow suits that character. This is emotional, visceral, with little basis in fact. Sometimes, naming a character takes an unexpected amount of time. Choices that ring true to me work in reverse, helping me know the characters better, so I can write more clearly about them. At the start of editing, I worked on one piece at a time. No longer. A manuscript section’s been open on the desktop for two hours. I’m happily tunneling around, changing words, tweaking phrases, flipping clauses from one end of their sentences to the other, re-ordering whole sections, when a citation shows up. There aren’t many citations in my memoir draft. Mostly, they’re for texts or films. This one pesters me: is it named properly every time it appears? Does it appear too frequently? The bigger the folder with edited files grows, the more questions about files I’m not editing right now zing through my thoughts. And the more minutes answering them takes. A remark in one piece will remind me of a totally different circumstance in another. Perhaps the topic is the same in both, or students in both hold opposite opinions, or maybe no connection springs out. 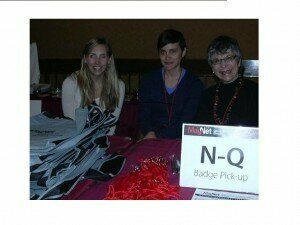 I envisioned adjusting descriptions to better mask identities, assessing whether situations were presented honestly. Expanding some pieces, eliminating others, doesn’t faze me. I did not anticipate the distractions of lateral thinking. Worse yet: when searching on key words to scrounge up from elsewhere in the manuscript what wasn’t bothersome till a minute before, I find errors I’d feared: not always, not even often, but too much. Working on one piece at a time until it satisfies (for now) is harder and harder. 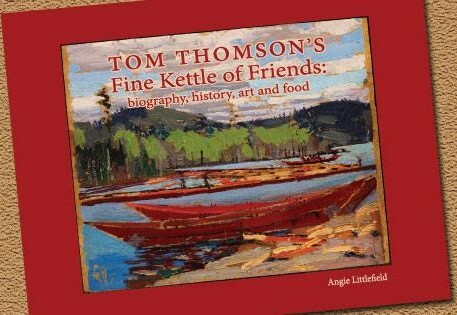 Tom Thomson’s Fine Kettle of Friends: Biography, History, Art and Food, is Angie Littlefield’s latest book. Launched at the Toronto Heliconian Club earlier this month, it’s about Tom Thomson’s exciting life rather than his tragic death. 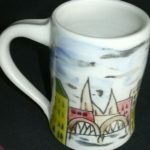 Brimming with reproductions of photos and documents, sketches and paintings, the book makes Tom’s urban and rural experiences and his relationships with a huge number of contemporaries vibrant and immediate. Tom’s donuts were famous, but Angie could find no evidence of exactly what they were like. The tale of her research and the plausible recipes she provides are mouth-watering, calorie-free food for thought. Angie’s website www.angielittlefield.com provides instructions for buying the book and lots, lots more. Click Book Talks at the top to find out when she’ll be speaking near you. 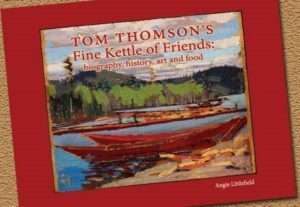 Scroll down on the main page to accept Angie’s free download offer for another of her books, Tom Thomson’s Toronto Neighbourhoods. Enjoy! Fifty commas deleted yesterday morning … total left is a secret. Listing all the sentences in a piece, each on its own line to ensure their length varies, reveals tense inconsistencies, more small mistakes. Doing so also inspires content adjustments … a mystery. Duplication searches highlight some words inocuous enough to show up without offense in every third sentence, some appearing tolerably every few paragraphs. Other words are so self-important they need confining to once per section, even only once per manuscript. The drudgery is logical, effective, thus enjoyable. 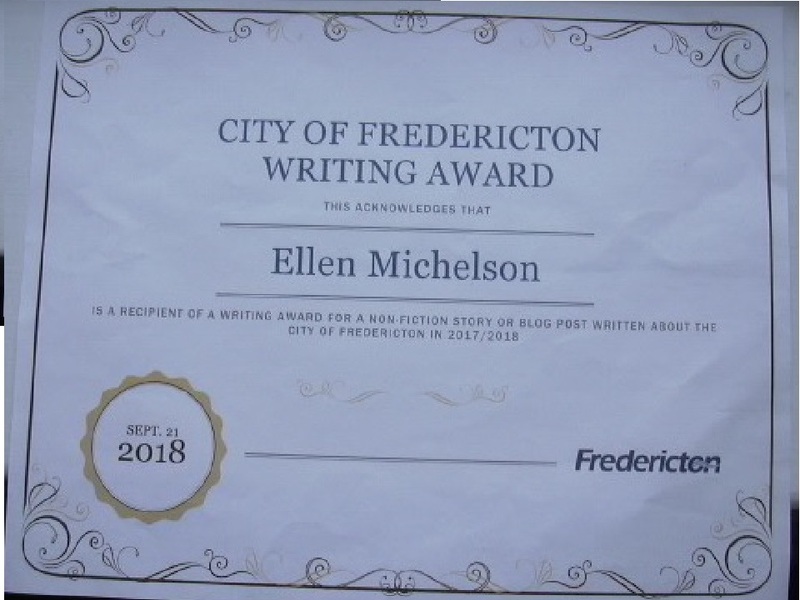 It inevitably displays, every ten or twenty pages, two identical words, each carefully chosen to be unique, in as many lines … a humiliation. These essentials blue-pencil hours and hours … a conundrum. Partial explanation: this morning’s three new commas. Exclamation points, supposedly, can be over-used. Not a problem for me. I thought. Burrowing again into pieces I considered edited revealed dozens and dozens more than I remembered. Almost all are gone now. My screen, with and then without the marks, showed me how exclamation points muffle, and how replacing them with periods (full stops) frees the words’ meanings to reach the reader. I trust. 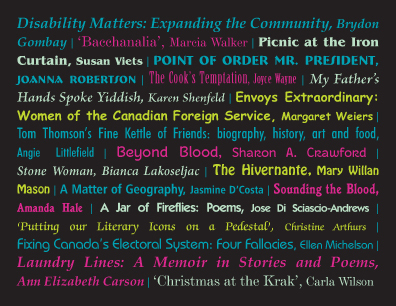 The Canadian Authors Association Toronto Branch will welcome members and non-members to the Toronto Public Library branch at 145 Annette Street, on Tuesday, April 4, 6:15-8:15pm. “Bring your best work, or a work in progress!” says Christopher Canniff, branch president. 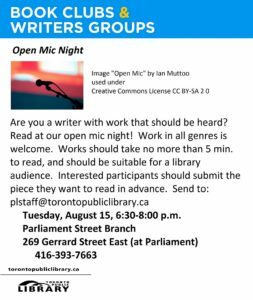 You may read for 3-5 minutes … if you sign up: president@canauthorstoronto.org. I’mm looking forward to reading three very short bits from the memoir I’m writing. For more info click here. You can paste text into a webpage you can easily find online. It will return a list of your words, showing how many times you’ve used each. Glaring goofs – clichés, pronouns with confusing antecedents, useless adverbs, the same multisyllabic bon mot twice in three lines – leave me shocked and appalled at missing them in numerous previous readthrus. Suddenly, my sweater feels too warm. The online tool doesn’t only force scavenging for synonyms. It makes me shrink the tally of words that just shouldn’t be there at all, like ‘just’ and ‘that’. And, more often than I want to admit, sentence hunks, even whole sentences containing a dupe or two, get trashed. Sometimes repetition strengthens a story, but is usually padding. Working through the list, deciding which words deserve attention, which are inocuous and infrequent enough to skip, is reassuring. I wish it didn’t take so long. Editing has somehow developed a routine for itself. Feedback from my writing group gets turned into comments marching down the right-hand side of the document. Sometimes there are so many they shrink one another and the lines to them make the marks on the page look like espaliered fruit trees. The comments wait for weeks, even months, if writing another section, or something altogether different, takes precedence. No matter how long getting to them takes, the first few words of each bring back the context, remarks others made, and my reaction at the time, which often changes when the manuscript is revisited. In fact, getting to the comments first thing the next morning has taught me that ensuring they’re thorough, then letting them ripen a while, leads to better results. I think. And hope. The words of the title, reading sounds, offer many interpretation possibilities. Here, I mean rhetorical tools like onomatopoeia and parallelism. Alliteration is the one that comes so automatically, I sometimes edit it out, fearing overuse. A teaching colleague, Grant Reynolds, showed years ago how the rhythm of English can help those learning the language. Hearing the words, audible only to me as the lines grow across my screen, convinces me not to change what just appeared to the terser ‘English’s rhythm’. Yet daring to compare writing to composing music is a step that scares me. Back home from the Xmas party. Met fellow member Dan Falk, who fascinated our table by explaining how he wrote “The Science of Shakespeare,” his most recent book. Wish he’d written it while I was teaching high school English! He’s giving a talk next month, Wednesday, January 11, 2017, 7pm, at the Toronto Public Library’s Leaside branch. 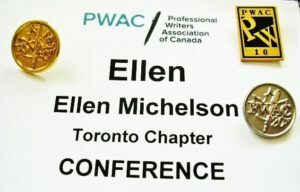 Chatting about our upcoming AGM and conference in Fredericton in May brought back memories of PWAC participation in MagNet conferences in Toronto. Here’s an old photo of a fine day. Most important are the students. Showing fun, fear, boredom, bliss, the daily ripples and that once-in-a-lifetime massive comber, hosting readers so they can get to know the students, is the goal. The manuscript consists of twenty vignettes, each about one or more students in a high school class, and twenty pieces to fit between the vignettes. The other pieces vary: a little poetry, a couple of rants, some out-of-classroom tales, an open secret or two about grades and exams… Now that the first draft’s done, an editing priority is pushing the person telling the stories into the background as much as possible. It’s a challenge. There isn’t much overlap among the characters from chapter to chapter, with one exception, the narrator. A trick: ask who is this happening to? If the answer can only be the writer, mentioning the writer isn’t necessary. You’ve figured out the memoir’s about teaching high school. And you’ve noticed this blogpost has no first person pronouns. Somewhat clumsy: practicing, experimenting continue. Hope you’ll keep reading as the editing generates more lessons and they’re shared. 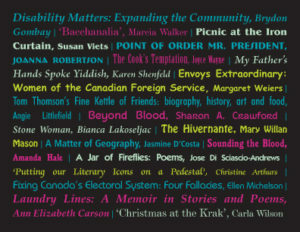 All publications listed are by members of the club’s literature section. The Toronto Heliconian Club, more than a century old, gathers women in the arts. Info on upcoming events is often posted outside the club, 35 Hazelton Avenue, in Toronto’s Yorkville. There are 97 posts and 60 comments so far.